Youngs ORA has a complex array of flavours, it’s malty, has a strong vanilla and oak character and has a subtle sweet rum character. Approx. 6.5% ABV. Barrel aged beers are extremely popular in the craft beer market and by beer lovers around the world over. Beer aged or served from wood is not a recent phenomenon by any means; beer was kept in wooden casks until the introduction of the first aluminium and then stainless steel casks. Part of the art of barrel ageing is creating beer that has both the character of the barrel and the character of the original beer. This strong American ale does exactly that and has that traditional flavour of a heavily toasted oak barrel and Rum to create a wonderful aromatic and complex beer that suits contemplative drinking. This stunning ale pours a deep ruby red colour with a lovely creamy fluffy head. Oak and deep toffee caramel dominate the aroma of this beer, there are also hints of rum that adds to the aroma of this wonderful ale. 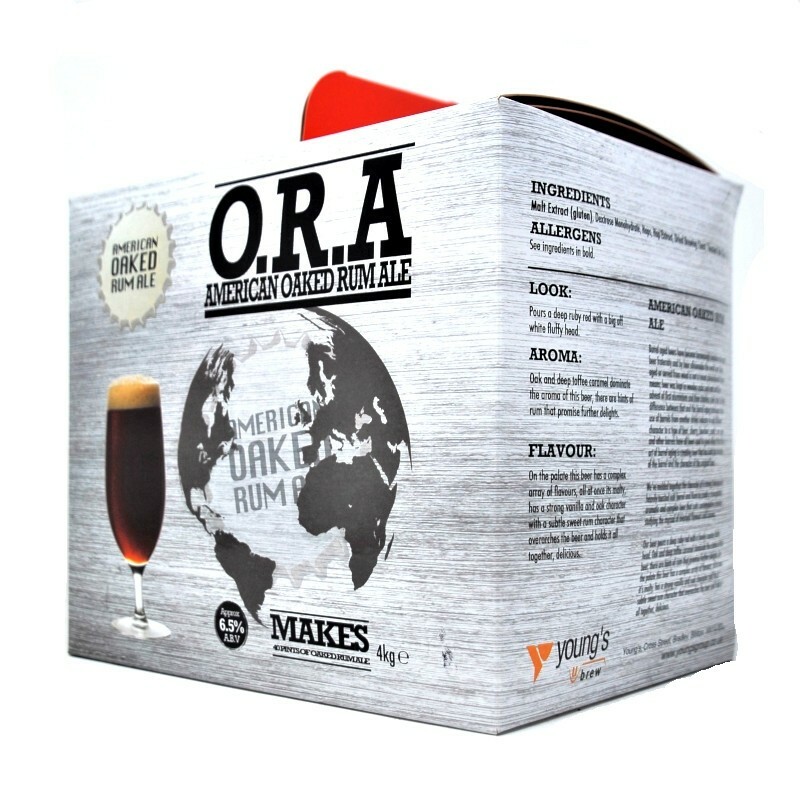 This beer has a complex array of flavours that come through all at once, it’s malty, it has a strong vanilla and oak character and has a subtle sweet rum character that over arches the beer and holds it all together to make this a delicious American Oaked Rum Ale. This kit makes 40 pints of American Oaked Rum Ale at approx 6.5% ABV. Young's developed the American range to bring the best of American craft brewing to the UK. The approach is simply based on the same philosophy as the American craft brewing industry; only the finest, fresh ingredients are used not sacrificing quality over cost. What really sets this range apart is the use of specially selected yeasts including Newcastle Dark Ale yeast and US West Coast Ale dried yeast sourced from an American craft brewery. These are all used to bring out the wonderful flavoursome liquid malt extracts with progressive style hops. These are skillfully combined to bring you a truly inspired range of premium quality American craft beer kits. Carbonation Drops or sugar will be required for priming your bottles to allow secondary fermentation, giving the beer its carbonation (fizz) and ensuring the beer is not flat. These can be found under the 'Ingredients' section on our website. Beer finings can also be added to the final brew to clear the beer. Beer finings can be found on our website under 'Ingredients' then 'Finings and Enzymes'.